Around the same time that Charles Herbert appeared in the Castle/Columbia thriller, he played the role of David Barker in several episodes of “The Donna Reed Show” from 1958-60 (produced by Columbia’s Screen Gems unit for ABC). From 1960-64, Martin Milner played the role of Tod Stiles (alongside George Maharis from 1960-63 and Glenn Corbett from 1963 to the end of the series in 1964) in the Stirling Silliphant–Herbert B. Leonard adventure/drama series, “Route 66” (also produced by Columbia/Screen Gems). Milner later played the role Officer Pete Malloy in Jack Webb’s crime drama series for NBC (alongside Kent McCord), “Adam-12” (1968-75). Margaret Hamilton was best known for her dual roles of Miss Gulch/the Wicked Witch of the West in the hit MGM/ Victor Fleming Technicolor film adaptation of “The Wizard of Oz” (1939). She later played the role of Mrs. Jackson in A. Edward Sutherland’s romantic comedy in Universal’s “Invisible” film franchise, ““The Invisible Woman” (1940). Rare 1960 Columbia Pictures TV spot for the release of William Castle’s “13 Ghosts,” featuring Charles Herbert promoting the “Illusion-O” ghost viewer. 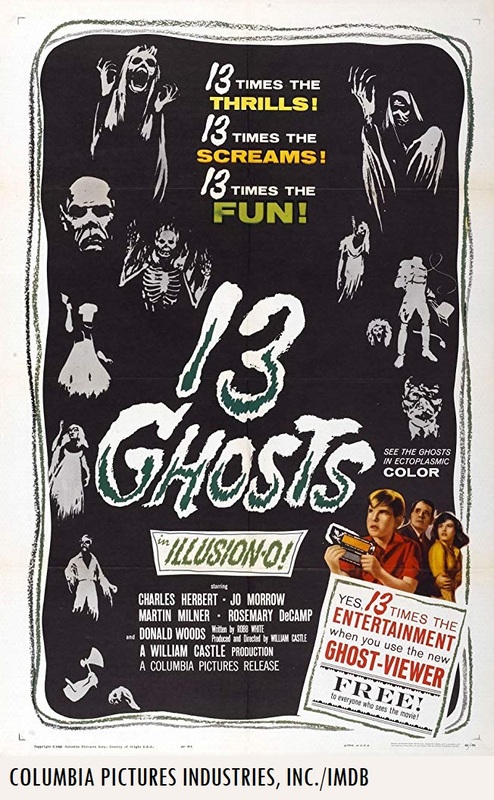 According to the American Film Institute’s database article on “13 Ghosts” (1960), audiences were given (non-3-D) Anaglyph-style “Illusion-O” decoders to see the “ghost” effect sequences during the original theatrical release of Castle’s Columbia thriller. The top gel area of the viewer was tinted red to decode the “ghosts,” while the bottom gel was tinted blue in order to avoid detecting the “ghosts.” Original theatrical prints of “13 Ghosts” had scenes that were tinted for the “ghost” sequences. According to John M. Miller’s article on “13 Ghosts” (1960) for Turner Classic Movies, Castle’s inspiration for the “Illusion-O” gimmick came from visits to his eye doctor. The master of macabre cinema filmed over 40+ test sequences in order to perfect the “Illusion-O” ghost effect scenes in the Columbia thriller. 41 years later, Castle’s thriller was remade by director Steve Beck, under the title of “Thir13een Ghosts” (2001, a modern-day adaptation of Robb White’s screenplay); with Tony Shalhoub (of TV’s “Wings” and “Monk” fame), Embeth Davidtz, Shannon Elizabeth, Matthew Lillard and F. Murray Abraham. The remake was co-produced by Columbia and rival studio Warner Bros.
Be sure to watch or record Svengoolie’s big coast-to-coast premiere broadcast of William Castle’s “13 Ghosts” (1960), this Sat. on Me-TV! Svengoolie (portrayed by Rich Koz), Kerwyn and all fellow SvenPals are ready for his Sat. 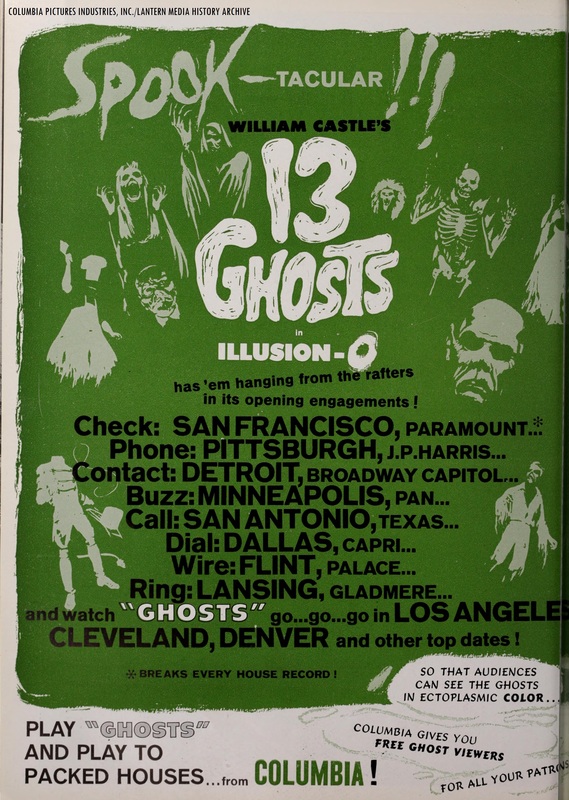 coast-to-coast big broadcast of premiere of William Castle‘s “13 Ghosts” (1960) on the airlanes of Me-TV! With Herbert, Morrow, Hamilton, Milner and an ensemble cast, you will not want to miss out on Svengoolie’s coast-to-coast big broadcast premiere of William Castle’s “13 Ghosts” (1960), this Sat. on Me-TV! A perfect pre-Halloween cinematic treat with Sven’s extended fun facts, Doug Graves’ song of the evening and Kerwyn’s “mail call!” Highly recommended to all fellow SvenPals, aficionados of classic thrillers/feature films from one of the masters of macabre cinema! Live-tweet with all fellow coast-to-coast #Svengoolie SvenPals (via Twitter) during Sven’s big coast-to-coast broadcast premiere of “13 Ghosts” (1960) on Me-TV! Sven is now officially on the Instagram airlanes! According to Sven’s official social media posting (via Twitter), he recently announced that he has a new Instagram account! Fellow SvenPals who use Instagram can now see Sven’s official Instagram feed, “@RealSvengoolie!” Congratulations, Sven from all of us fellow coast-to-coast SvenPals on joining the Instagram airlanes! -C.H. Chicago’s very own will meet Berwyn’s very own! Sven’s alter-ego, Rich Koz will be making an upcoming on-air guest host appearance on Chicago’s WGN Radio (720 AM) on Mon., Oct 29 with the executive producer of Sven’s Sat. Me-TV show, Jim Roche from 11 p.m.-1 a.m. Central/Midnight-2 a.m. Eastern (WGN’s 50,000 watt signal can be received throughout most of the country overnight)! And on Halloween day (Wed., Oct. 31), Sven will be making a daytime guest appearance with WGN’s very own Bill Leff and Wendy Snyder on the “Bill and Wendy Show” at 11:30 a.m. CT/12:30 p.m. ET! “Chicago’s Very Own,” WGN Radio is also simulcasting online on the official WGN Radio site! 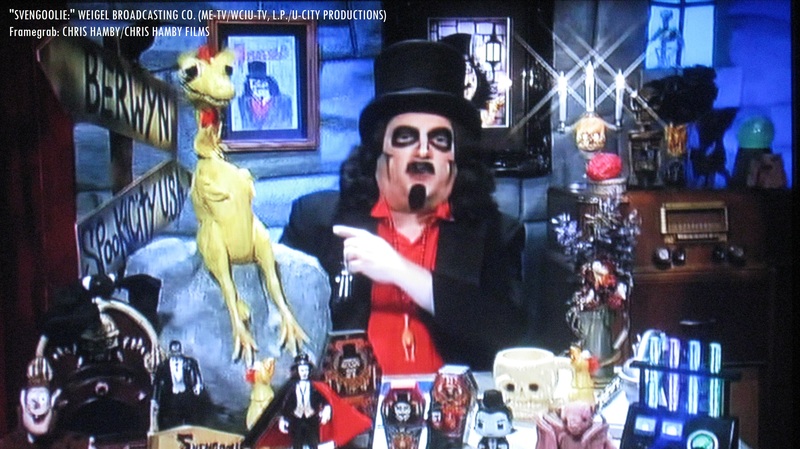 Fellow Chicago/Berwyn/Volo/Des Plains SvenPals and fellow SvenPals who are traveling to Chicago/Berwyn/Volo/Des Plains: Drive to the world-famous Volo Auto Museum on Sat., Oct. 27 for Svengoolie’s upcoming appearance at the Volo Museum (27582 Volo Village Rd. Volo, IL 60073) for Sven’s autograph and professional photo session by the staff photographer of the VoloMuseum from Noon to 2 p.m. (local time)! Be sure check out the vintage cars, including iconic automobiles from film and television (including the “Drag-U-La” racer from “The Munsters”) Note: No personal cameras are allowed during Sven’s professional photo session at the Volo Auto Museum (according to Sven’s official site). (3000 S. River Road Des Plaines, IL 60018) for the Cube Nightclub Halloween Costume Party from 11 p.m.-1 a.m. (local time), with legendary Chicago disc jockey Julian “Jumpin’ ” Perez! Sven will also have a photo and autograph session during the Rivers/Cube costume party and Sven will also be emceeing the contest! Additional details can be found on the official Rivers Casino site! And on Halloween night, Sven will be making an appearance with the legendary Chicago Bulls basketball team during the Bulls’ Halloween game (United Center in Chicago, Illinois)! David G. Cookson’s recent mention of Sven in his “Goodreads” blog post on Svengoolie, “Mystery Science Theater 3000” and Fred Rogers! An eyewitness account of Svengoolie’s recent appearance with legendary rock-and-roll icon Freddy “Boom Boom” Cannon! Fellow super SvenPal Nanette Keir recently attended Sven and Freddy’s live rendition of the “Svengoolie Stomp” during the Oct. 20, 2018 “Nightmare on Chicago Street” horror/costume/zombie festival in Elgin, Illinois! A brief snippet of Freddy “Boom Boom” Cannon’s live rendition of his 1959 song, “Tallahassee Lassie” was also included in Nanette’s video (according to the video description on Nanette’s official YouTube channel)! Congratulations to Nanette and to all fellow Chicago super SvenPals on seeing Sven in person again and Freddy in person, along with Sven & Freddy’s live rendition of the “Svengoolie Stomp!” Glad to hear you all had fun during Sven & Freddy’s “Nightmare on Chicago Street” appearance from all of us fellow coast-to-coast super SvenPals! We’re all proud of you! -C.H. Wake up and jam along to more jammin’ Halloween tunes with fellow super SvenPal Jamie Lee and her live WNUR/Northwestern University Sat. morning big broadcast radio show, “Jammin’ with Jamie!” Jamie will be continuing her Halloween jam session series and has encouraged all fellow SvenPals and jammers to send in requests for Halloween tunes from theatre, film and television! Again, if you have a Halloween-related song in mind, be sure to send in your song request(s) to Jamie’s official Twitter page or Jamie’s official site before this upcoming Sat. and jam along to more jammin’ Halloween tunes on “Jammin’ with Jamie;” Sat. mornings at 6 a.m. Central/7 a.m. Eastern on the airlanes of WNUR (89.3 FM in the Evanston/Chicago/Berwyn area; online at WNUR.org and/or the TuneIn app from coast-to-coast and around the globe)! A fun and fantastic jam session/radio program from all fellow SvenPals and jammers everywhere! Keep on’ jammin’, Jamie and all fellow super SvenPals and jammers from coast-to-coast! Again, all of us fellow coast-to-coast SvenPals and jammers are proud of you! And again (via GoFundMe), be sure to spread the word/give generously to help one of Jamie’s PM&L friends with additional medical treatments by helping to offset high costs! –C.H. A brief sampling of “Maxwell House Coffee” ads featuring Margaret Hamilton as Cora (ca. 1976), from the Internet Archive/Duke University AdViews. 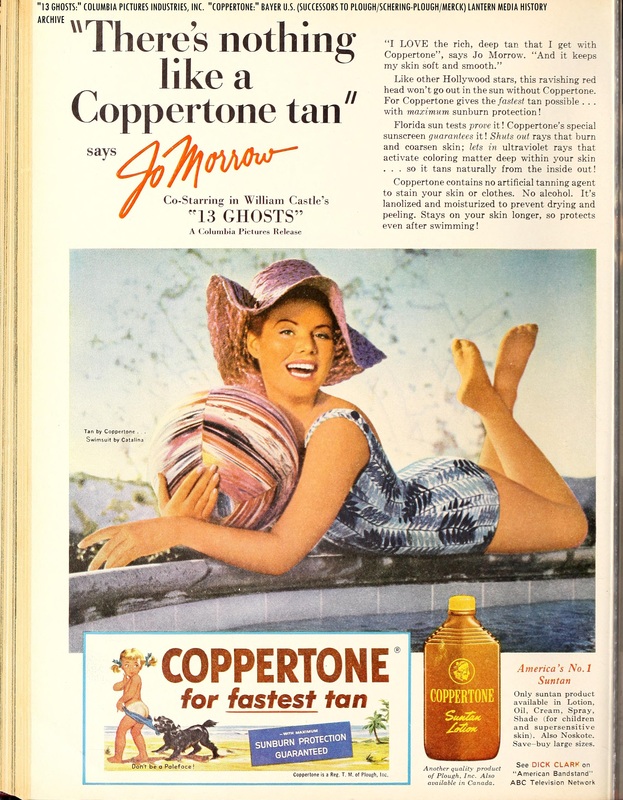 The second ad is also available on the Internet Archive. Watch Martin Milner in select episodes of “Route 66” for free, via Shout! Factory TV/Shout! Factory (which owns the rights to the “Route 66” TV series; according to a 2011 press release from Shout! featured on the “TV Shows on DVD” website). The series was originally produced by Columbia Pictures’ “Screen Gems” television unit. According to a 1965 Screen Gems syndication ad from Broadcasting Magazine, future Me-TV affiliate WTTG-5/Washington aired re-runs of “Route 66” at the time. 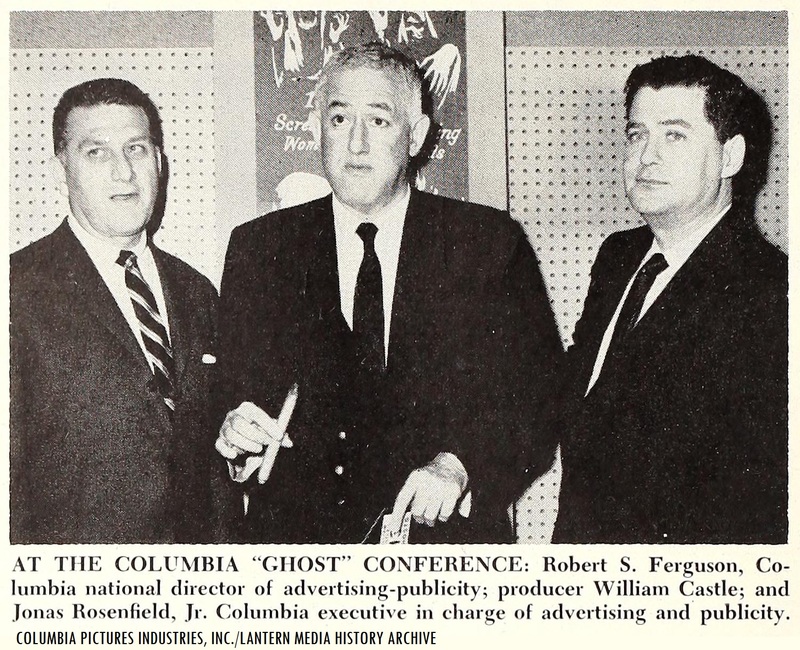 From the May 1960 edition of “Motion Picture Daily,” during a William Castle/Columbia press conference for “13 Ghosts” with Columbia Pictures advertising executives Robert S. Ferguson and Jonas Rosenfield. 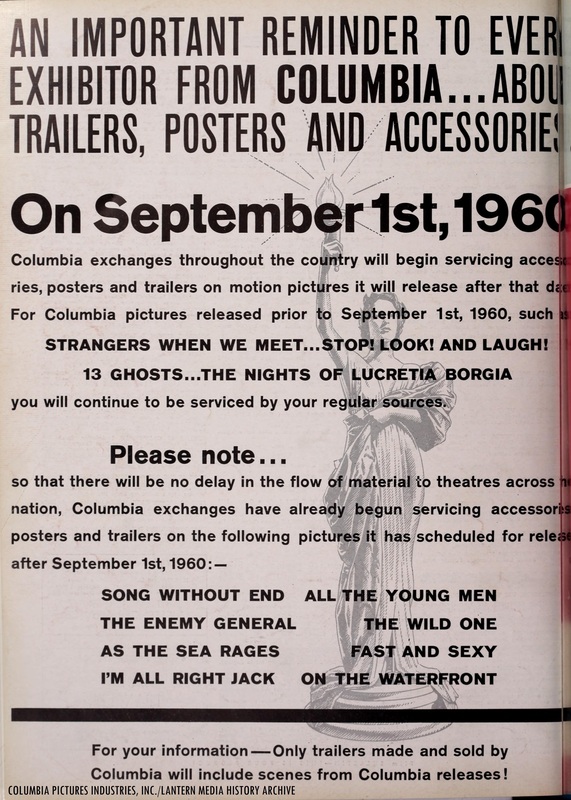 A 1960 Columbia Pictures exhibitors’ leaflet, informing cinema owners that Columbia trailers and posters for upcoming releases would be handled in-house. 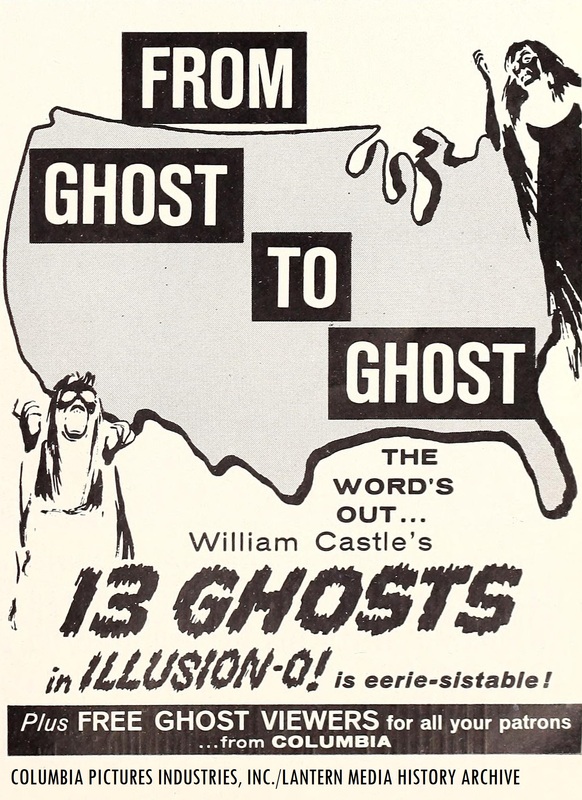 William Castle‘s “13 Ghosts” was not affected by the studio’s promotional changes. “13 Ghosts” is also available on Blu-Ray as part of the William Castle/Columbia double feature (paired with his 1963 entry, “13 Frightened Girls”) and on DVD as part of the “William Castle Horror Collection” anthology set of select Castle/Columbia thrillers from Mill Creek Entertainment (by arrangement with Columbia Pictures Industries, Inc./Sony Pictures Entertainment/Sony Pictures Home Entertainment). “13 Ghosts” is also available as a standalone Sony DVD title. Questions/Comments about “Svengoolie” and/or his big coast-to-coast broadcast premiere of William Castle’s “13 Ghosts” (1960)? Drop a line in the comments section! Saw this in a classic film theatre years ago and I loved it! Greetings, Gemma! Glad to hear you enjoyed my recent blog post on Svengoolie and William Castle’s “13 Ghosts” (1960)! That’s neat that you got to experience William Castle’s classic Columbia ghost thriller on the big screen! I enjoyed seeing Svengoolie’s coast-to-coast big broadcast premiere of “13 Ghosts” (1960) last evening!